This recovery is enabled by three advanced technologies that have been combined for the first time worldwide, being the Wastrip and Pearl reactor by Ostara and LysoTherm by Dutch-based Eliquo Water & Energy. The new sludge treatment installation will annually produce 900 tonnes struvite and has an energy surplus of 2 million kWh that will be delivered to the national grid. The installation was officially commissioned on 17 June in the presence of principal Tanja Klip-Martin at water board Vallei and Veluwe, CEO Robert F. Kennedy at Ostara and CEO Reinhard Hübner at Eliquo. The Pearl reactor for the recovery of struvite, is Canada-based Ostara´s first commercial plant in Europe. With a production capacity of 900 ton per year, it is not Ostara´s biggest reactor. At the world´s largest wastewater treatment, Stickney Water Reclamation Plant in Chicago, USA, Ostara recently started operations at a Pearl reactor that produces 10.000 ton struvite per year. Although the production volume of the Pearl reactor at wwtp Amersfoort in the Netherlands is much smaller, the struvite reactor is an important element of the business case for the energy and resource recovery. Ostara recovers the struvite as a high-value fertilizer that is sold as Crystal Green. This product is 99,6% pure struvite and, according to Ostara has the unique feature that the phosphorous is released at the roots of a crop, reducing leaching and run off, and protecting local waterways from nutrient pollution. 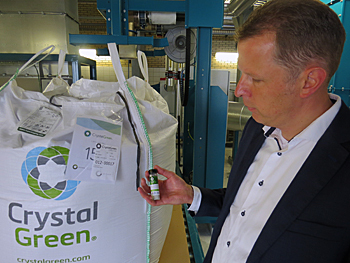 At wwtp Amersfoort the Crystal Green granules are collected in big bags and Ostara has entered contract to purchase the big bags for the next ten years. The guaranteed purchase of the struvite is an important element of the business case and water board Vallei and Veluwe expects that the sale of the struvite will cover up 20 to 30 percent of the costs of the new sludge treatment plant. The Pearl reactor recovers 45 percent of all phosphorous that arrives at the wttp. Of the remaining phosphorous some 10 percent leaves the plant with the effluent and 45 percent with the dewatered sludge cake. The high phosphorous recovery rates also relates to Ostara’s Wasstrip technology (waste activated sludge stripping to remove internal phosphorous). This technology mixes the primary and secondary surplus sludge as it arrives from the water treatment. The Wasstrip diverts 60 percent of all phosphorous directly to the Pearl-reactor and reduces the uncontrolled formation of struvite in the digester. Another remarkable feature of new sludge treatment plant at wwtp Amersfoort is the high energy recovery. Before the sludge is digested it is enhanced with Eliquo’s thermal pressure hydrolysis (TPH) process called LysoTherm. The sludge is heated at 150 – 170 0C for 30 to 60 minutes , disintegrating the sludge bacteria and enabling a higher biogas production in the digester. Remarkable at the LysoTherm process is the use of thermal oil, combined heat and power plants (CHPs) and heater exchangers. According to Eliquo the LysoTherm process can increase the biogas production up to 50 percent. In case of wwtp Amersfoort the biogas production – as a result of all measures – is increased with 60 percent and the three 500 kWh CHP produce enough energy to run the wwtp, with an annual surplus of 2 million kWh that can be delivered to the national grid. Another advantage of the thermal pressure hydrolysis process is the better dewatering of the digestate. The final sludge cake has a dry weight of more than 30 percent which reduces the handling costs considerably. The new sludge treatment plant reduces the sludge volume by 17 percent and reduced the overall operations costs for the whole wwtp with 15 percent. The payback period for the new sludge treatment plant is estimated at 7 years. Vallei and Veluwe has now two what is called ‘energy and nutrient recovery factories’. The first one was commissioned at wwtp Apeldoorn in June last year. The waterboard’s initiative to upgrade its sludge treatment, fits in a national policy by all 22 regional Dutch water boards to no longer regard wastewater as merely a by-product to be treated and processed, but as a valuable source of renewable energy, raw materials, and clean water. Eight Dutch wwtps have already been transformed into ‘energy factories, having an energy surplus over its own energy demand, with preparations underway for a further nine factories. In addition, phosphate is already being recovered at seven sites. The first two wwtps to have fine screens for the recovering of cellulose are under construction. And two wwtps have been planned to be converted to recover alginate.